Nickerson State Park in Brewster, MA was our camping destination for the last week in August. We loved the fact that the Cape Cod Rail Trail (CCRT) was easily accessible and that there was a marvelous pond close to our campsite. One of our day trips during this week was to Skaket Beach in Orleans via the CCRT and a short hop on some local roads. The ride from our campsite to the beach was approximately 3 – 4 miles round-trip with bikers in our group ranging from age 7 to adult. The younger kids were pulled in trailers, and both experienced and less experienced riders were able to ride to the beach without difficulty. Skaket Beach is a bay-side beach, typically offering calmer and warmer waters. The beach also has a concession stand and clean bathrooms—it was the perfect place for us! 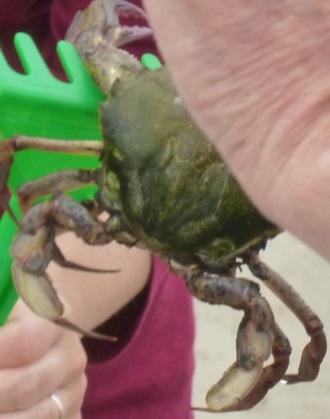 What makes Skaket a fun destination is the fact that at low tide (11:43 a.m. on the day we were there) the water is so far from the beach that you can walk out for a distance and see many types of crabs and small fish that have been left exposed by the retreating water. Our group of kids had a fantastic time digging in the sand, finding and then building pools to hold their captured critters. The best part was that we knew that the animals would find their way safely back into the ocean once the tide came in later that day. Another adventure took place on one rainy day when we visited Salt Pond Visitor Center in Eastham. We watched two videos and learned about Cape Cod and visited the museum. In addition, we received a Junior Ranger activity book for free! 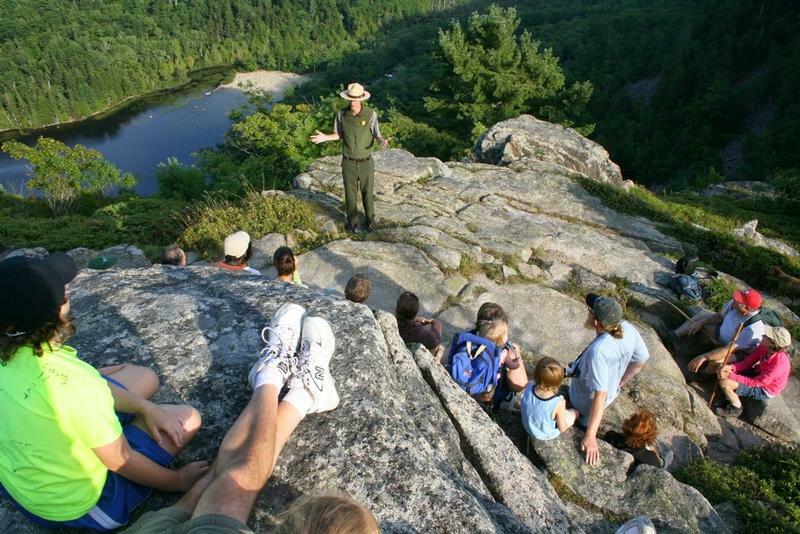 In order to earn a patch as a Jr. Ranger, you must participate in a ranger-led activity. Luckily, the rangers had an open house at the Edward Penniman House that day. Edward Penniman was known for his success in the heyday of whaling, and his house had running water and was on the leading edge of water recycling. 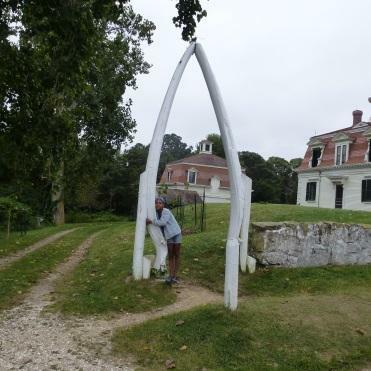 There was even a giant whale bone at one entrance to his house –whales are big! After visiting the house, we found trails that led us down to the marshes and we explored the area. One of the highlights of camping at Nickerson State Park is its close proximity to a full range of activities the Cape has to offer. We can’t wait for our next trip! 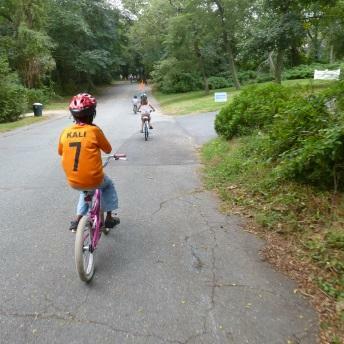 Kids Outdoors says that the Cape Cod Rail Trail is a “22-mile trail, idyllic for bicyclists, with scenic beach views and easy riding. For bikers and beach lovers, it doesn’t get much better…” You can also comment on this trip pick and give it your own rating! Before visiting Cape Cod Rail Trail, you can also view and print off a map, here: http://www.mass.gov/eea/docs/dcr/parks/trails/prints/ccrt.pdf. Nickerson State Park, near the trail’s midpoint, is a great base for cyclists who want to spend more time in the area. The park offers 400 campsites, swimming, paddling, and fishing. About the blogger: Kai Long is a featured guest blogger as part of AMC’s Kids Outdoors Boston Parent Ambassador program, which partners with local parents to share their outdoor experiences with this online community and beyond. Kai enjoys exploring the outdoors with her 10-year-old daughter and lives just outside of Boston.